For the brand of cosmetic makeup, see Maybelline. 30-second sample of Chuck Berry's "Maybellene"
"Maybellene" is one of the first rock-and-roll songs. It was written and recorded in 1955 by Chuck Berry, and inspired/adapted from the Western Swing fiddle tune "Ida Red," which was recorded in 1938 by Bob Wills and his Texas Playboys. Berry's song tells the story of a hot rod race and a broken romance. It was released in July 1955 as a single by Chess Records, of Chicago, Illinois. It was Berry's first single and his first hit. "Maybellene" is considered one of the pioneering rock-and-roll songs: Rolling Stone magazine wrote, "Rock & roll guitar starts here." The record is an early instance of the complete rock-and-roll package: youthful subject matter; a small, guitar-driven combo; clear diction; and an atmosphere of unrelenting excitement. The lyrics describe a man driving a V8 Ford chasing his unfaithful girlfriend in her Cadillac Coupe DeVille. The song was a major hit with both black and white audiences. It has received numerous honors and awards. Soon after its initial release, cover versions were recorded by several other artists. The title is misspelled "Maybelline" on several releases. It has been asserted that it was a common practice in the 1950s to alter the instrumental parts and lyrics of old songs and represent them as new songs. With such changes the original songs were often not identifiable, particularly if the melody was modified. This practice took place because copyrights on older recordings were rarely asserted. As Chess had predicted, the lyrics appealed to teenagers fascinated by cars, speed and sexuality. "Maybellene” was one of the first records to be a hit on the rhythm and blues, country and western, and pop charts. 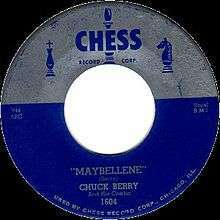 Featuring some inimitable Chuck Berry riffs, some blues-style picking on a guitar and Johnson’s piano, which added a hummable rhythm to the steady backbeat, "Maybellene" was a pivotal song in the emergence of rock and roll. This exciting fusion of a rhythm-and-blues beat with a rural country style was the catalyst for the emergence of rock and roll in the mid-1950s. In the 1950s, some record companies assigned publishing credits to disc jockeys and others who helped to promote a record, a form of payola by means of composer royalties. For this reason, the disc jockey Alan Freed received credit as a co-writer of "Maybellene". Russ Fratto, who had loaned money to Chess, also received credit. (Some Chess insiders have said that Chess owed money to Fratto, a printer and stationer, for producing record labels.) The Freed and Fratto credits, which do not appear on the original Chess single (see the photograph above), were withdrawn in 1986. However, as of 2014, these credits still appear on some reissues of Berry's recordings. In 1955, the song, a 12-bar blues, peaked at number five on the Billboard pop chart and was number one on the R&B chart. Billboard's year-end charts in 1955 ranked "Maybellene" number 3 on the Top R&B Records Retail Sales and Juke Box Plays charts. The record sold one million copies by the end of 1955. In 1988 "Maybellene" was inducted into the Grammy Hall of Fame for its influence as a rock-and-roll record. The Rock and Roll Hall of Fame included "Maybellene" in its list of the "500 Songs That Shaped Rock and Roll" (also included are Berry's recordings of "Rock and Roll Music" and "Johnny B. Goode"). In 1999, National Public Radio included it in the "NPR 100", the one hundred most important American musical works of the 20th century, chosen by NPR music editors. "Maybellene" is currently ranked as the 98th greatest song of all time, as well as the second best song of 1955, by Acclaimed Music. The song is ranked number 18 on Rolling Stone's list of "500 Greatest Songs of All Time. Columbia records released a version by Marty Robbins (21351) by the end of August 1955. His version was the number 13 "Most Played by Jockeys" in the country-and-western market by mid-October. and soon Columbia was touting it as one of its "Best Selling Folk Records". By November it was noted that the record had "won considerable pop play". Other versions available in mid-October 1955 were by J. Long (Coral 61478), J. Lowe (Dot 15407) and R. Marterie (Mercury 70682) with the song listed as number 14 top selling in the nation. Allmusic lists cover versions by more than 70 performers, including Elvis Presley, the Everly Brothers, Simon and Garfunkel (in a medley with "Kodachrome"), George Jones, Carl Perkins, Johnny Cash, Bubba Sparks, Foghat, Gerry & the Pacemakers, Johnny Rivers and Chubby Checker. In 1964 a cover version by Johnny Rivers reached number 12 on the Billboard Hot 100 and number 9 on RPM magazine's Top 40-5s Singles chart. ↑ Rudolph, Dietmar. "A Collector's Guide to the Music of Chuck Berry: The Chess Era (1955–1966)". Retrieved 2007-03-01. ↑ "Maybellene". Rolling Stone. Retrieved 2007-03-01. ↑ NPR. 'Maybellene' by Jesse Wegman, July 2, 2000. ↑ Guralnick, Peter (1999). Feel Like Going Home: Portraits in Blues and Rock 'n' Roll. Back Bay Books. Boston: Little, Brown. p. 234. ISBN 0-316-33272-0. 1 2 3 4 Altschuler, Glenn C. (2003). All Shook Up, How Rock 'n' Roll Changed America. Oxford University Press. ISBN 0195139437, ISBN 9780195139433. ↑ American Historical Review, characterizing the fusion of genres in the mid-1950s as a new American music. ↑ Palmer, Robert (1995). Rock & Roll: An Unruly History. pp. 137–138. ↑ Crouse, Richard (2012). "Maybellene: Chuck Berry". Who Wrote the Book of Love?. Random House. ISBN 9780385674423. ↑ Whitburn, Joel (2004). Top R&B/Hip-Hop Singles: 1942–2004. Record Research. p. 55. ↑ "1955's Top R&B Records". Billboard: 20. January 7, 1956. Retrieved February 12, 2011. ↑ New York Public Library Staff (1996). The New York Public Library Performing Arts Desk Reference. Macmillan. Retrieved April 7, 2013. ↑ "Grammy Hall of Fame Inductees (Letter M)". Grammy Awards. National Academy of Recording Arts and Sciences. Retrieved February 12, 2011. ↑ "500 Songs That Shaped Rock and Roll by Artists (A–C)". Rock and Roll Hall of Fame. Archived from the original on May 24, 2007. ↑ "NPR 100". National Public Radio (NPR). ↑ "Acclaimed Music Top 3000 songs". Acclaimed Music. 25 April 2015. ↑ "Rolling Stone's 500 Greatest Songs Of All Time". Rolling Stone. April 2010. Retrieved September 18, 2015. ↑ Billboard, Oct. 15, 1955. p. 46. ↑ Billboard, Oct. 29, 1955. p. 32. ↑ Billboard, Nov, 12, 1955. p. 36. ↑ Billboard, Oct. 15, 1955. p. 5. ↑ "Maybellene". Allmusic. Archived from the original on June 3, 2009. Retrieved 2007-03-01. ↑ Whitburn, Joel (2010). "Section 2: The Songs". The Billboard Book of Top 40 Hits (9th ed.). Billboard Books. p. 802. ISBN 978-0-8230-8554-5. ↑ "Top Singles — Volume 2, No. 5, September 28, 1964" (PHP). RPM. Canada: Library and Archives Canada. October 1, 2004 [March 31, 2004]. "Curious Mind (Um, Um, Um, Um,Um, Um))"